The 2016 AGM was held for the first time at the DKH Adventure Playground next to the wood, on Thursday 27th October from 7pm. We started with a report from the Chair about this year’s activities, which included a winter work day, a spring work day to weed the hedge, a meeting with Sainsburys contractors about the trees they cut illegally, scything of the meadow, planting of 2 new trees in the orchard (Laxtons Special & Worcester Pearmain), a bat walk, campaigning to protect Green Dale from development and the application for CGS money to re-gravel the paths in the wood. We then voted the 2017 committee: Jonathan Coe stepped down due to moving abroad and we welcomed Hans as our new Vice-Chair. There then followed a general meeting where we discussed the latest news: CGS money for paths, purchase of bulbs for the new glade and the tidying up of the concrete path down the side of the wood that leads to green Dale (this was done as a one-ff by the council). We also discussed our concerns: the hedges need a serious prune and that is a massive job, the sign in the “wild area” has still not been mended by the council, the play area is quite dangerous as the logs have rotted into the ground, 2 of our nice woodcrete bird/bat boxes have broken and we need replacement parts, Sainsburys never did compensate us for coming into the wood and cutting down lots of trees without permission, the dry hedge needs sorting out down the side of the park and the variegated archangel that is growing along the concrete path is inf act an invasive species like Japanese knotweed and needs removing before it takes over. Following this was a re-cap on things Green Dale from Chris Rowse and Guy Haslam and we discussed other local planning applications that have an impact on local biodiversity. We then had a rare treat: a recently recovered Gaumont film from the Green Dale studios which shows what is purportedly the world’s first car chase! This all takes place outside the current Fox on the Hill pub on Denmark Hill. 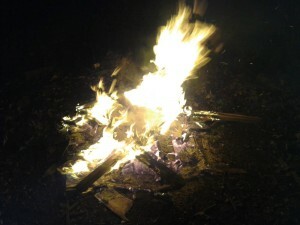 After the meeting was closed, we had a lovely bonfire in the grounds of the adventure playground. Members brought along food and drink to share – including a huge home-baked sour dough bread and some poached quinces from the DKH Wood orchard. Many thanks to those who came and took part.